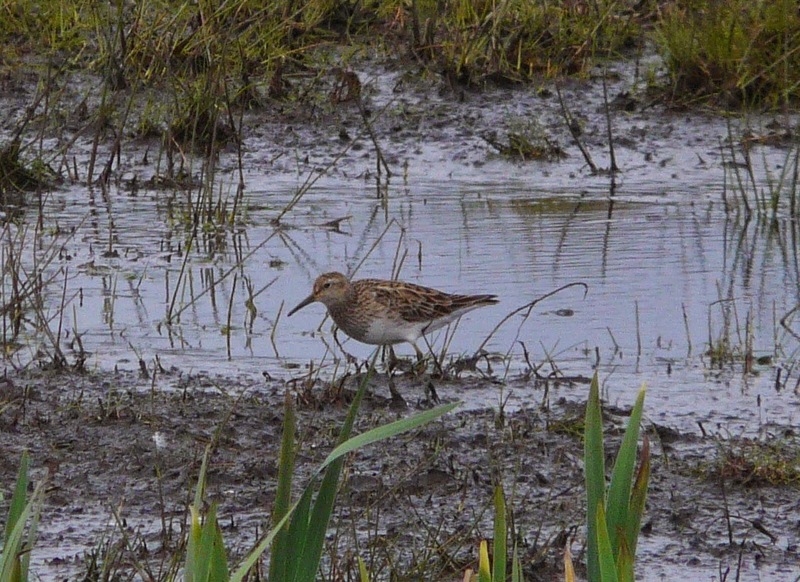 The penultimate day of the month little change but for a summer-plumaged Curlew Sandpiper on Bewan Loch and a flava Wagtail, but the Quail was still singing and a Garganey was on Brides' Loch along with a Grey Heron and first-summer Little Gulls on Hooking had increased to 4. Three Sandwhich Terns were on Gretchen Loch and just a female Red-backed Shrike remains. The 31st brought two new additions as a Little Tern flew south down the west side and finally, a Bluethroat. Glimpsed at the Bird Observatory in the afternoon before making its way into a mist-net and delighting our guests. Elsewhere on the Island were 27 Lesser Black-backed Gulls, 3 Whimbrels, a Short-eared Owl, and at Holland were 3 Spotted Flycatchers, 4 Collared Doves, 3 Spotted Flycatchers and a Siskin. Light easterly winds and blue skies were interrupted by occasional bands of fog and increased coverage of 75% on both dates. 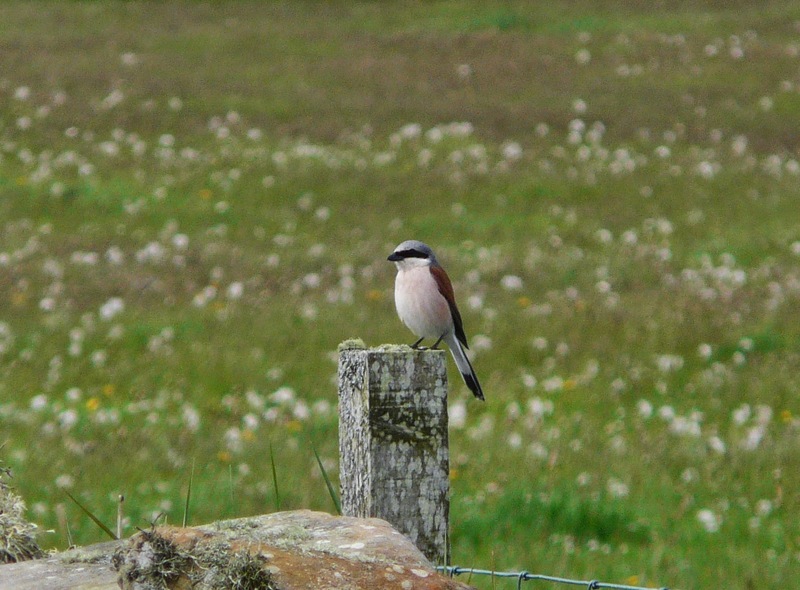 Red-backed Shrikes were the undoubted highlight on 28th with at least 8 different individuals spread about the Island. Kittiwakes were again seen in good numbers with 434, unfortunately this is likely a worrying sign further north. More encouraging is the continuing increase of Arctic Terns settling down and the first Starling and Black-headed Gull chicks are out and the Quail continues to sing at Ancum. 5 Manx Shearwaters were seen from Dennis Head and 5 Black-tailed Godwits flew north. The Pink-footed Goose remains on Hooking Loch where 2 first-summer Little Gulls were hawking insects, whilst 2 Song Thrushes were new and other migrants were 2 Common Sandpipers, a Tree Pipit, Whitethroat, 3 Lesser Whitethroats, 2 Blackcaps, 5 Chiffchaffs, 4 Willow Warblers and 6 Spotted Flycatchers. More late migrants were seen on 29th with 2 Woodcocks and a Robin, whilst a female Honey Buzzard flying north in the afternoon was a welcome addition and the first since May 2009. A female Sparrowhawk was also seen along with single Woodpigeon, Cuckoo, House Martin and Garden Warbler, and just 3 of yesterdays Red-backed Shrikes remained. The 26th was quiet with another first-summer Little Gull the highlight. A Sparrowhawk was trapped and ringed at Holland and a Lesser Whitethroat at the Observatory. Singles of Woodpigeon and Blackcap, 8 House Martin, 32 Wheatear, 14 Black-tailed Godwits. In contrast to yesterday, the 27th produced seemingly nothing but scarce migrants, the first of which being a Wood Warbler at Sennes followed by a male Red-backed Shrike at the lighthouse, and later on 2 additional females. A male Nightjar was trapped and ringed at Holland and a Quail was singing at Ancum. In the evening a Marsh Warbler was discovered in an Iris ditch near Holm, and as it was seen to be wearing a ring-attempts were made to catch it, but these frustratingly failed! 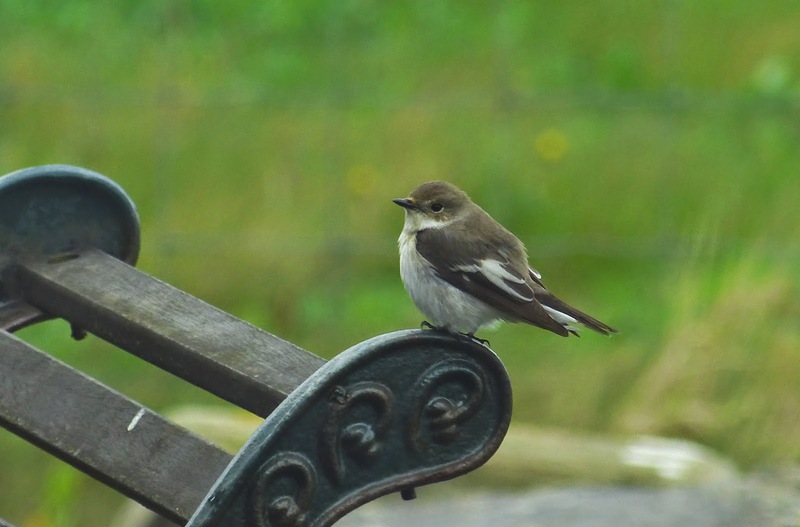 Also there was a Pied Flycatcher at Ancum House whilst 5 Spotted Flycatchers were seen and a Pochard was on Hooking Loch. Arctic Terns continue to flood in with todays total being 2865, many of which are displaying and scrape digging so fingers crossed... The Glossy Ibis was seen at Hooking, the Swift and at least one Cuckoo were still with us and a trickle of northbound waders included 26 Turnstones, 23 Sanderlings, and a Dunlin. New highlights included a female Blue-headed wagtail at Lurand and more unusual, a singing male Lapland Bunting at Nether Linnay. Other migrants were a Sparrowhawk, Sandwich Tern, White Wagtail, both Common and Lesser Whitethroat, 2 Garden Warblers, 3 Chiffchaffs, 5 Willow Warblers, 2 Spotted Flycatchers, Snow Bunting and 9 Redpolls, most if not all being Mealy Redpolls. A seawatch from Westness from 0700 - 1030 produced more Long-tailed Skuas, with a single followed soon afterwards by a flock of 4. Also during the watch were 6 Arctic, 14 Great and one Skua sp. , 110 Puffins and 350 Auk sp. After many feeding flocks at sea the previous day large numbers of Arctic Terns settled along the coast with a minimum of 2655 seen with 686 Kittiwakes mixed amongst them and a Little Gull was on Gretchen Loch. Three Woodpigeons, Whitethroat, 5 Chiffchaffs and 5 Willow Warblers were seen on both dates and Cuckoo, Sand Martin Blackcap and 2 Spotted Flycatchers were on 24th. The latter species increased to 3 on 25th, Garden Warblers to 2 and a Lesser Whitethroat trapped and ringed at the Observatory. Birds ringed at Holland House included both Lesser and Mealy Redpoll as well 4 Redpoll sp. seen. Single Redwing, Tree Pipit and Common Sandpiper were logged as was our first Swift, and other migrants consisted 10 House Martins, 246 Ringed Plovers, 13 Black-tailed Godwits, and heading north; 4 Curlew and 5 Whimbrels. A very wet and windy day became increasingly so it progressed with northerly winds significantly reducing the temperature. A cuckoo was trapped and ringed at Holland before and at least one other was present along with Garden Warbler and 5 Spotted Flycatchers, and the first Little Stint of the year was on Gretchen Loch. Seawatches from Westness produced little by midday but our hoped for species was realised during the afternoon watch with 2 Long-tailed Skuas passing by at 17:50. Other seabirds noted were a Red-throated Diver, 6 Manx Shearwaters, 7 Arctic and 6 Great Skuas. 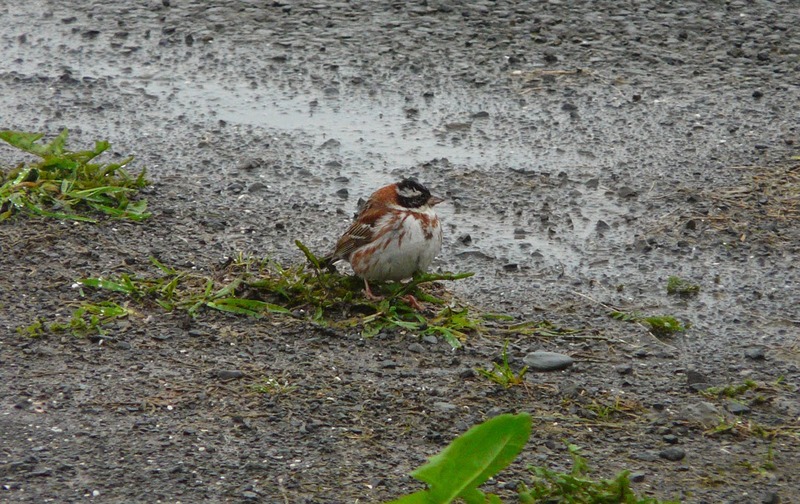 Increasingly heavy rain and winds switching to the north made for difficult birding conditions today with just 17% coverage, but one soggy observer was rewarded with a fine male Rustic Bunting by the airfield. 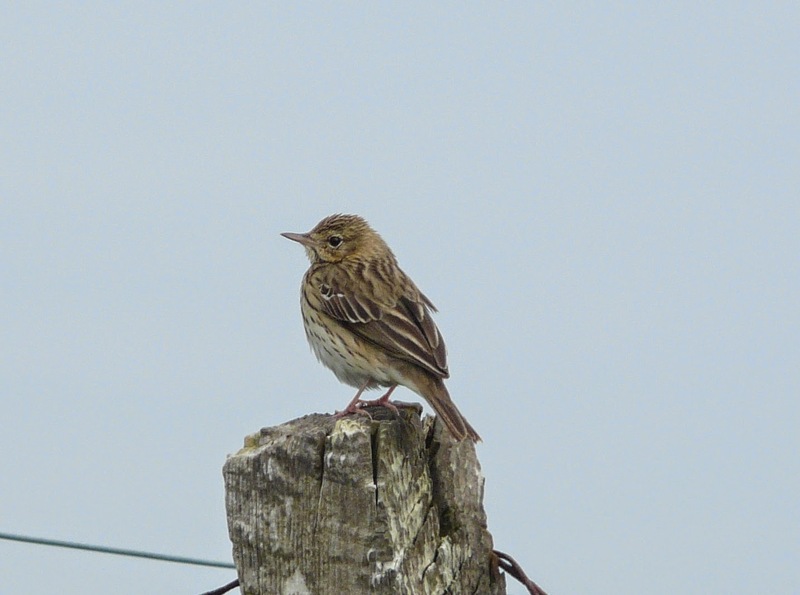 Also seen were a Tree Pipit, Song Thrush, Redwing, 2 Whitethroats, 4 Willow Warblers and 2 Spotted Flycatchers. 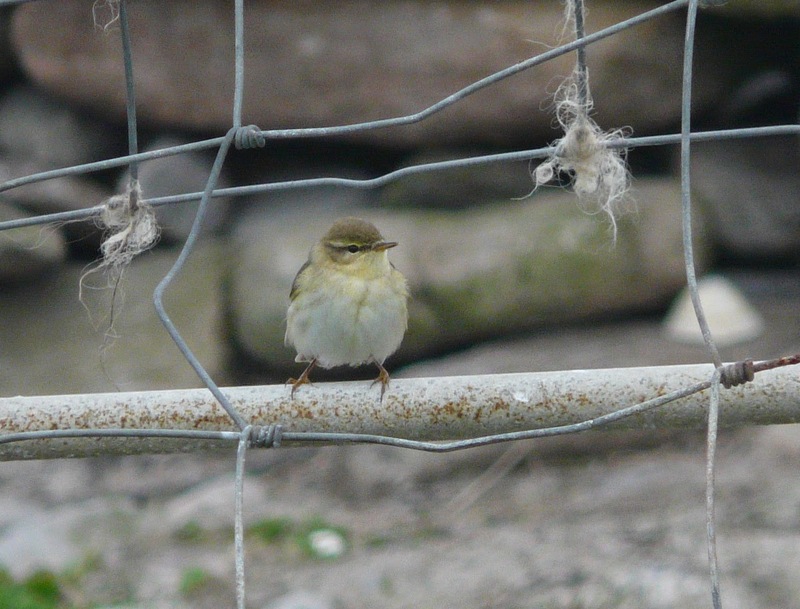 Mist-netting on 19th saw a Sparrowhawk, one of 3 Tree Pipits there and a Pied Flycatcher trapped and ringed as well as single Sedge Warblers on both dates indicating passage birds (at least 4 singing males currently on the Island). An Osprey flew low north early morning as did a Crossbill. Sightings of Robin and Redwing were a touch unusual whilst elsewhere two each of Woodpigeon and Collared Dove, 10 House Martins, 63 Wheatears, 3 Blackcaps, Willow Warbler, Chiffchaff, 2 Spotted Flycatchers, 3 Siskins and a Lesser Redpoll. The 20th was much quieter but did include a female Grey-headed Wagtail, Green Sandpiper at Lurand, 2 Barnacle Geese, a White Wagtail and 2 Chiffchaffs. Rain early morning put mist netting on hold but 2 Tree Sparrows, one of 2 Tree Pipits were trapped there in the evening and a Wryneck was trapped at the Observatory. The Glossy Ibis re-appeared at Hooking Loch where 2 Pink Footed Geese were and 9 Barnacle Geese flew north. 10 Red-breasted Mergansers were counted around the coast where feeding waders included 375 Ringed Plovers, 75 Knot, 270 Sanderling, 147 Purple Sandpipers, 203 Dunlin and 919 Turnstone. At least one Wood Sandpiper was present, a Cuckoo was at Holland House an 2 Sand Martins and a respectable 17 House Martins were counted. 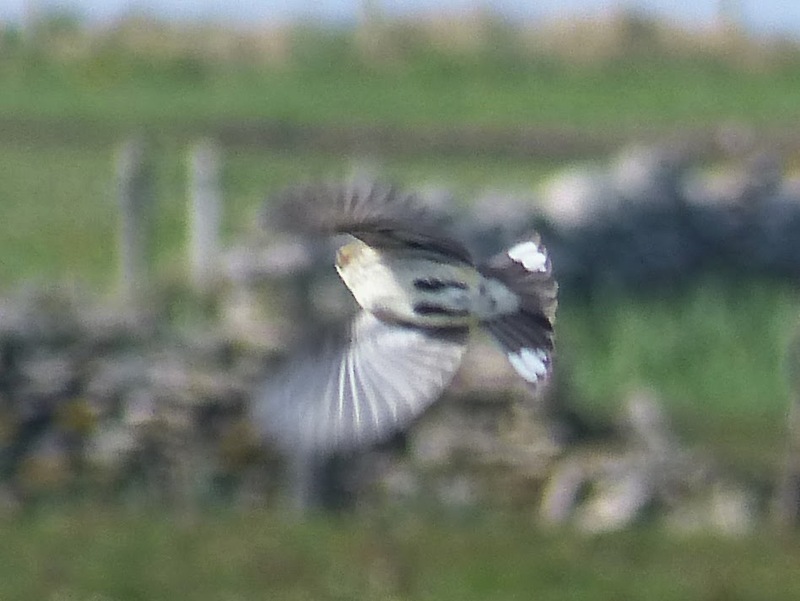 3 White Wagtails were on the North Links whilst a male Grey-headed Wagtail was seen by Gretchen. Also present were 3 Woodpigeons, 6 Collared Doves, 130 Wheatears, 2 male Pied Flycatchers, single Lesser and Common Whitethroats, 4 Blackcaps, 2 each of Willow Warbler and Chiffchaff and 6 Common Redpolls. Coastal waders continue to dominate sightings over the two days with some impressive numbers passing through, especially on 17th and the majority being in smart summer-plumage. Counts from that date included 8 Golden Plovers, 200 Ringed Plovers, 106 Knots, 389 Sanderlings, 166 Purple Sandpipers, 124 Dunlins, 20 Whimbrels, 12 Bar-tailed Godwits and 1210 Turnstones. There was also our second Pectoral Sandpiper of the spring which showed well for an hour or so on a small scape near Bridesness, and a Wood Sandpiper was at Ancum (with it or another at Gretchen briefly on 16th) while the days highlight was our second Goosander of the year-a redhead which flew south over the island mid-morning. Other birds of note from the 17th included a Barnacle Goose, a Sparrowhawk, 21 Lesser black-backed Gulls, 5 Collared Doves, a Woodpigeon, a Tree Pipit, a handful of new Warblers including a Garden Warbler and a late wave of Wheatears with 71 counted. The previous day (16th) had been quieter but there were 2 Common Sandpipers and with roughly half the number of the above wader species present. Arctic Tern numbers were up to 866, a male Redstart and 4 Mealy Redpolls were seen and there was a movement of hirundines, with 144 Swallows, 8 Sand Martins and 3 House Martins having gathered at the south end by the evening. Our quiet spell continues with the only rewards from 40% island coverage on 14th being 3 Black-tailed Godwits, a lingering Common Sandpiper, a handful of common Warblers and 3 Common Redpolls. There was no systematic census coverage on 15th with the only sightings coming from an all-day birding tour for day-trippers and a brief hour long sea-watch off Westness in the evening. There were plenty of the expected Wader species seen on the tour and in similar numbers to recent days, but also at least 2 Kestrels, a Woodpigeon, 4 Collared Doves, 800 Arctic Terns and an there was an influx of hirundines with 70 Swallows, 2 Sand and 3 House Martins. Meanwhile on the sea-watch, most notable were the first 2 Manx Shearwaters of the year, 22 Puffins and 5 Lesser black-backed Gulls. At least the weathers been nice! Its been a relatively quiet few days although there has always been the odd new passerine to just about keep our legs going-mainly appearing in the Holland House mist nets or around the Observatory. 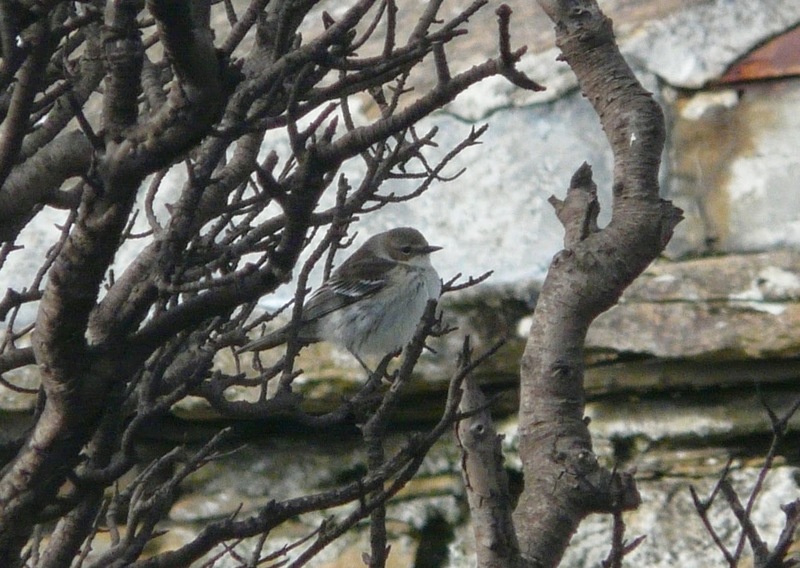 The 30% island coverage on 12th turned up a female Ring Ouzel, 3 Pied Flycatchers, a mixture of Warblers including 2 new Whitethroats, a Brambling, 6 Common and 2 Lesser Redpolls-all split between the two locations mentioned above. The best to be had away from these were 8 Black-tailed Godwits at Ancum and a Common Sandpiper at Gretchen. On 13th just 15% of the island was covered (something we might live to regret with news of our neighbours latest scoop filtering through! ), with the harrowing/seeding of the sacrificial bird crop on the Observatory croft taking priority for most the day. There wasn't a lot seen with a Collared Dove, a similar selection of Warblers to the previous day and singles of Common, Lesser and something in-between Redpolls trapped and ringed. A different view of a Redpoll-this ones a Mealy. 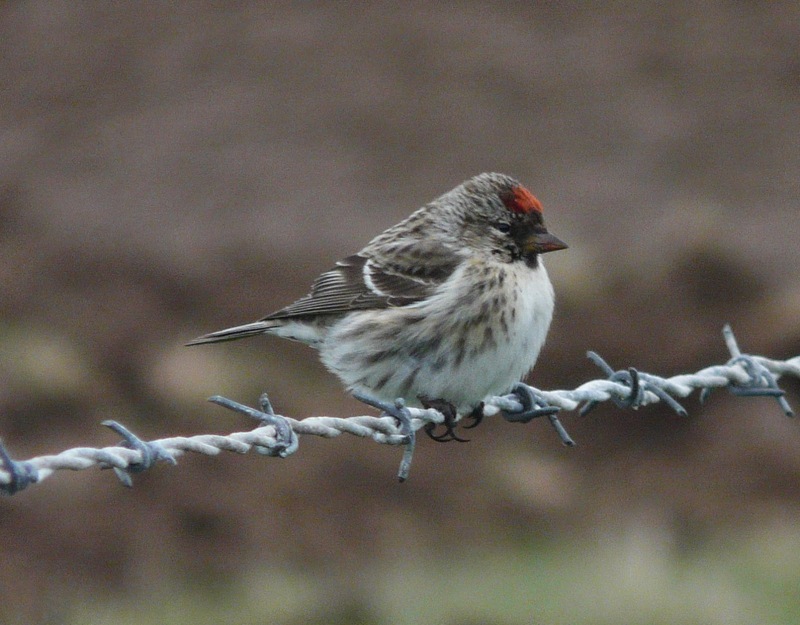 Its been a fantastic spring for both Mealy and the usually scarce Lesser Redpolls on the island this year. At least 14 of the latter have been recorded so far-all of them trapped/ringed (including a Belgian control) and identified when in the hand. 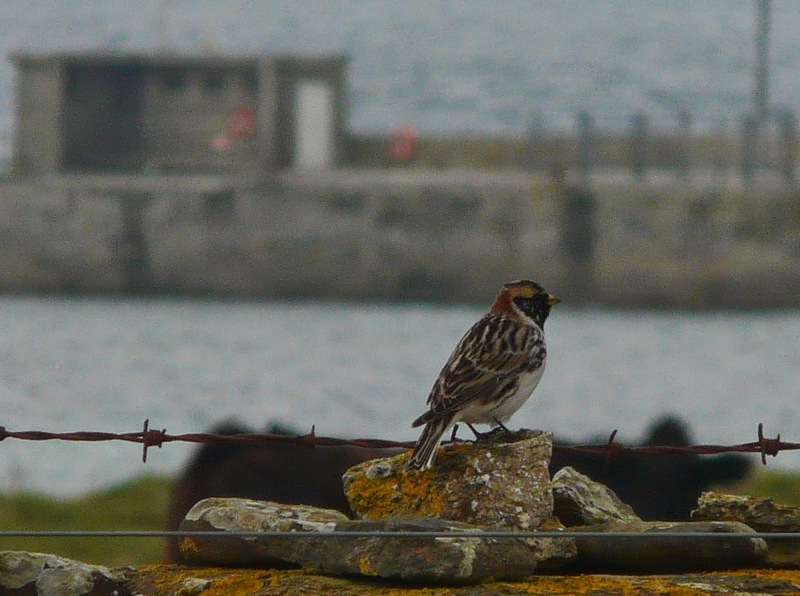 Redpolls are renowned for being a bit of a nightmare but they've all been relatively distinctive and straightforward birds-that is until today, when we caught an ambiguous individual with plumage features indicative of Mealy but all the biometrics pointing to Lesser! While the weather has remained good throughout, its felt a little bit static on the migrant front as leftovers from last week moved on. Coverage was slightly reduced with 25% on 10th and 35% on 11th and with it came a thinning of passerine numbers with just a sprinkling of Warblers (a few of which were newly arrived though) over both dates and a couple each of Tree Pipits, Robins and Pied Flycatchers also of note. The Glossy Ibis was seen again on 11th, along with a pair of Garganey while wader numbers typically continue to build with 55 Knot, 163 Sanderlings, 118 Purple Sandpipers, 336 Turnstones and a Common Sandpiper also on the latter date. We're rapidly running out of sun-cream at the moment with all this hot weather and the 8th was another such, scorching day-not that were complaining! 35% of the island was birded but it was clear many of the previous days passerines had used the clear, bright night to move on with just a drake Garganey over Holland, 9 Black-tailed Godwits, 32 Knot and a Sparrowhawk out south while we ate dinner outside of note. A bit more cloud and drizzle during the morning of the 9th was more productive, with 2 Fieldfares, a Garden Warbler, a Whitethroat, 6 Blackcaps, 12 Willow Warblers and the first Spotted Flycatcher of the year found in with the same level of coverage, but with an additional 5 hours spent at the nets. The Glossy Ibis was still at Hooking, with 9 Great Northern Divers-virtually all in stunning summer plumage off the coast, a late Goldeneye and Common Sandpiper seen. Arctic Terns have increased quickly over the last few days with over 300 now present. Many have been seen carrying fish so hopefully they'll be settling down to form colonies soon-fingers crossed time again!! Another red-hot day weather wise, but limited coverage with just 35% achieved as plenty of time was spent in the morning searching the area frequented by yesterdays Yellow-rumped Warbler. 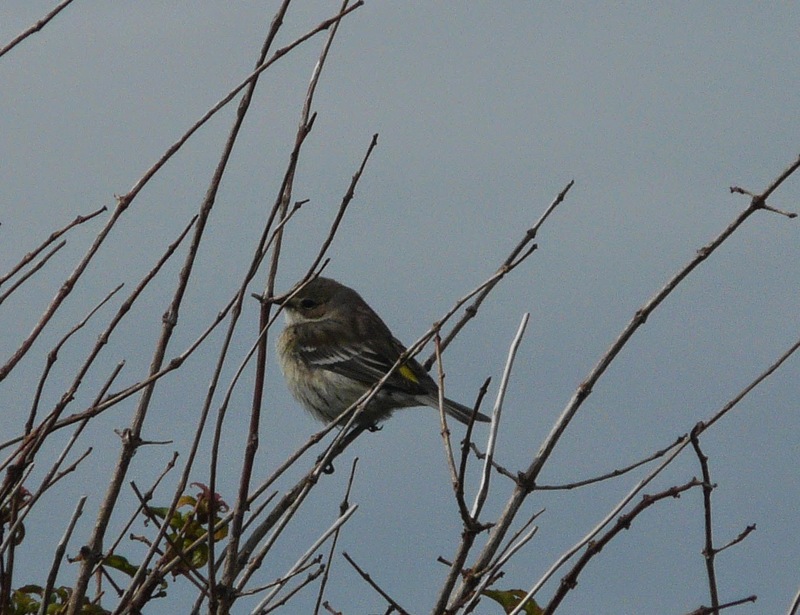 There was no sign, perhaps not surprising once news filtered through early-afternoon of a Yellow-rumped Warbler on Unst, Shetland-some 130 miles north of us! 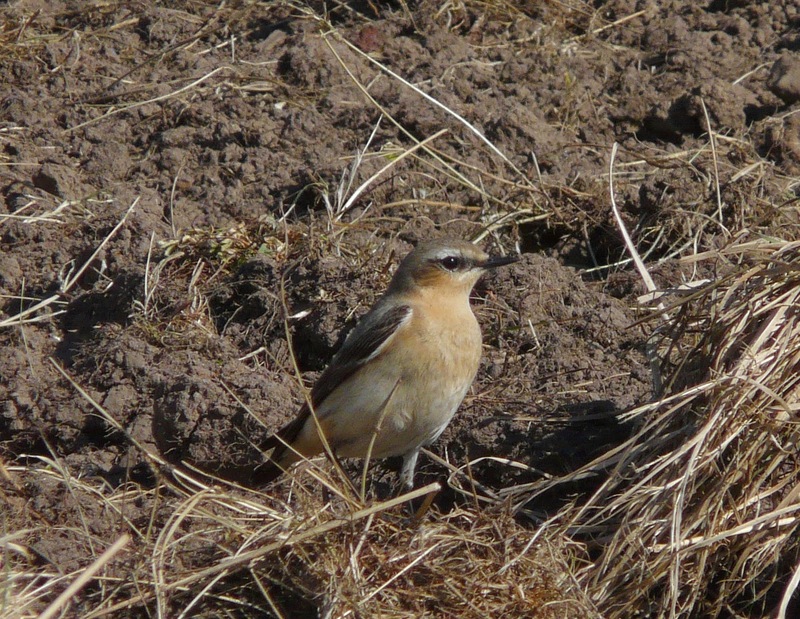 A check of the photo's revealed it to clearly be the same bird and a remarkable occurrence of such a rare bird being discovered on consecutive days. There were a few new arrivals, namely a Reed Warbler in the same gardens frequented by yesterdays American visitor with 3 Garganey, the Glossy Ibis and the Wood Sandpiper in the same area. Most of the other activity was at Holland House where 3 Tree Sparrows, 2 Mealy Redpolls, 4 Lesser Redpolls (including a Belgium control), a Goldfinch and 2 Siskins dropped in at various times of the day. A Short-eared Owl was also seen while 9 Bar-tailed Godwits, 5 Whimbrel and a flock of 30 Curlews passed over. 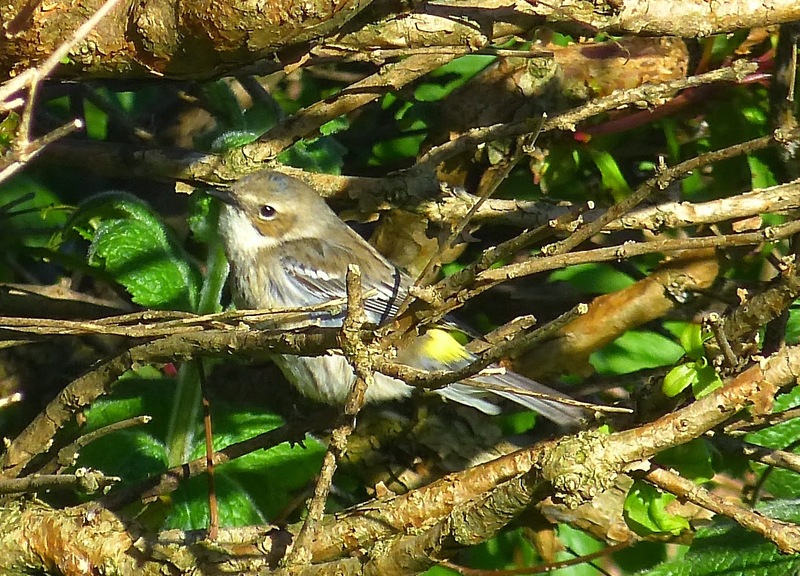 More photo's of yesterdays Yellow-rumped Warbler have been added to our facebook page-the files are too large to be shown here so click on the link on the right of this page to see them. A day to remember, but it began with heavy rain, and fog which eventually cleared﻿ to leave a bright sunny day. There was clearly plenty about when we ventured out after lunch with 7 Garganey noted early on, frequenting various scrapes and pools around Hooking-breaking the previous record count by considerable distance. 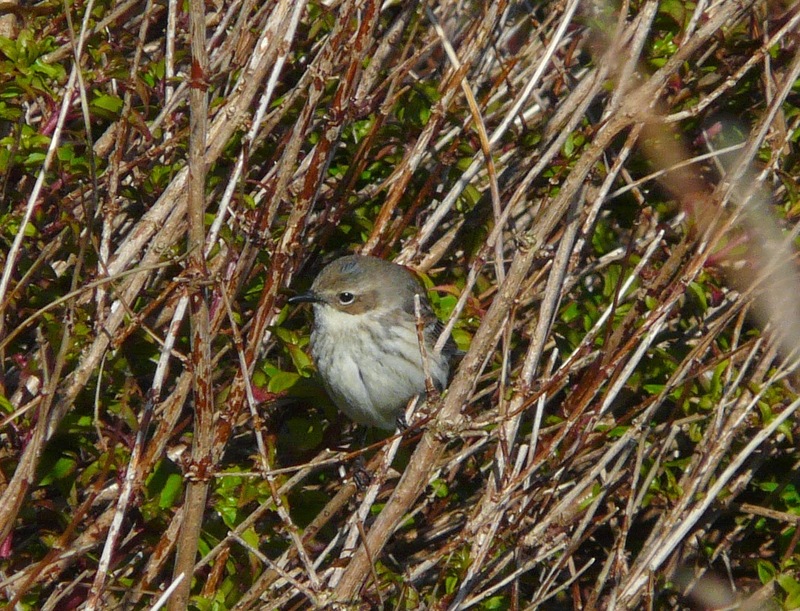 The Short-toed Lark was found to still be at Lenswick, and the Glossy Ibis at Hooking but pandemonium kicked in when a YELLOW-RUMPED WARBLER was discovered in the garden at Scott's Haa. the bird had clearly only just arrived and was initially incredible mobile being lost several times, before settling down back at its original location by the evening. Remarkably this is the 2nd North Ronaldsay record (following one in Oct 1995) and 3rd Orkney (Evie 2005). There were plenty of waders about too with a Wood Sandpiper nearby and 93 Ringed Plovers, 276 Dunlins, 6 Knot, 95 Dunlins and 417 Turnstones counted. A Dotterel joined the Lark at Lenswick late in the evening, 10 Great Northern Divers were offshore and a male Sparrowhawk seen. Little to report from a drizzly, foggy, miserable 4th with the most sensible opting for indoor based work or whichever James Bond film was on TV! Just 15% of the island was covered and only the Hawfinch at Holland House and 3 Mealy Redpolls warrant a mention. The fog had cleared by mid-morning the next day and the welcoming sound of returning Arctic Terns filled the sky-100 present in total. 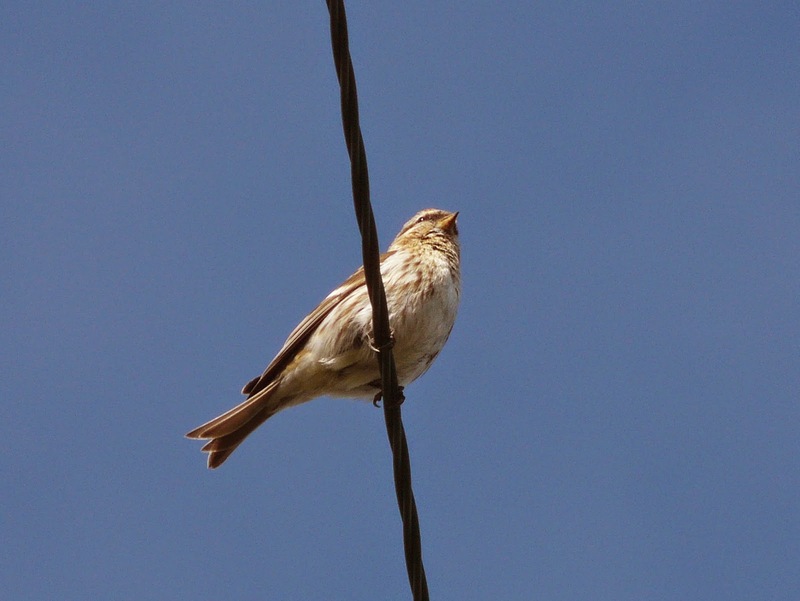 There was plenty to else to report from 50% coverage with the first Cuckoo of the year near the mill, 2 Grasshopper Warblers (Nether Linnay and Holland), a pair of Garganey at Ancum and an obliging Short-toed Lark at Lenswick late in the evening the highlights. Waders always build-up in early May and 656 Turnstones, 182 Purple Sandpipers, 10 Dunlins and 6 Whimbrels were logged during the days census. A Kestrel and 2 Sparrowhawks were also new, as were 2 Goldfinches and a Lapland Bunting. The Hawfinch remains and a Whitethroat, 15 Blackcaps, 11 Chiffchaffs, a Ring Ouzel, 10 Bramblings and 3 Mealy Redpolls made up the rest of the days most 'notable' sightings. Another pleasant and sunny day, with several new species for the year recorded. 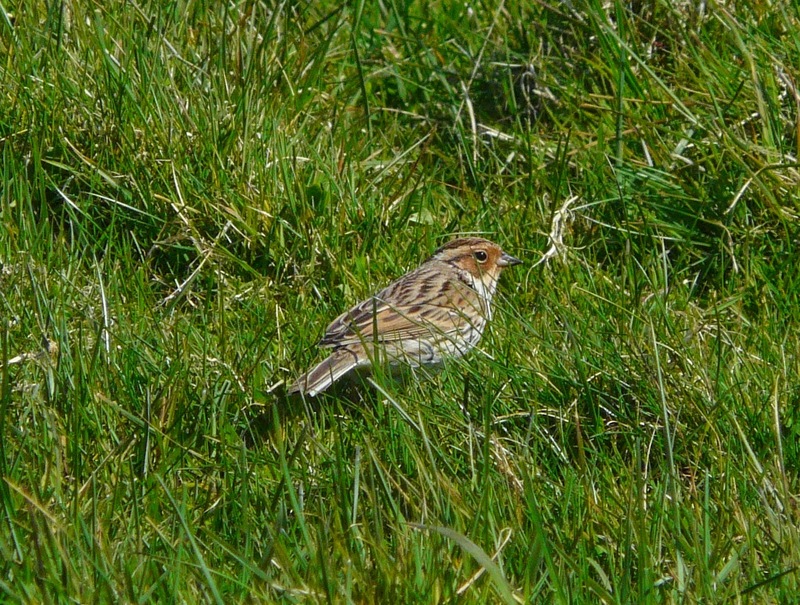 Much time was spent searching the southern coastline but there was no sign of last nights Spotted Sandpiper, but a Little Bunting in the Bewan garden at the north end, being our first ever spring record made for an adequate replacement. A Tree Sparrow at several locations was also the first of the year, while the Hawfinch and Wryneck both remained at their respective locations. The Glossy Ibis was still at Hooking, the first 17 Knot of 2014 were together at Bewan Loch where a Common Sandpiper was also present and 6 Arctic Terns passed overhead. Groups of 5 Barnacle and 2 Pink-footed Geese were newly arrived and there was more 'corvid ' passage featuring 2 Jackdaws, 7 Carrion, 8 Hooded Crows and 2 Rooks. 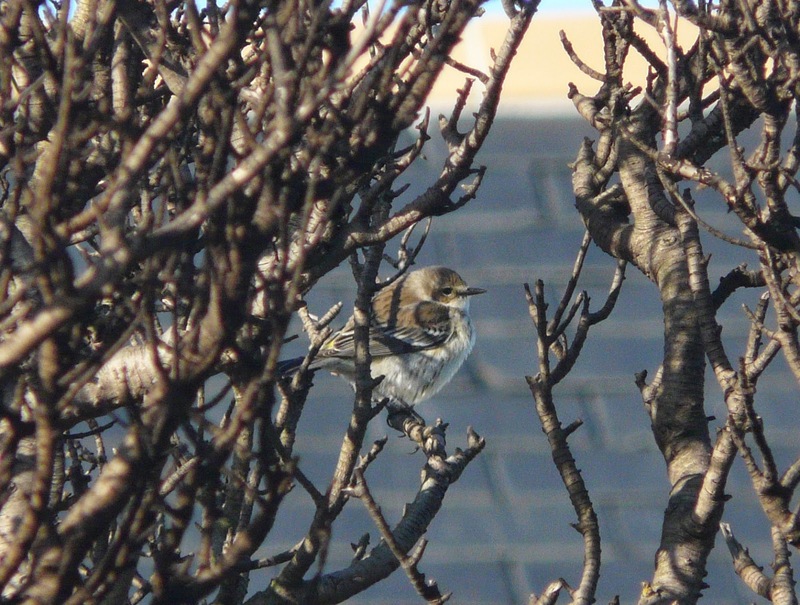 There was another Black Redstart, this time at Scottigar and at least 6 Common and a single Lesser Redpoll zoomed about along with slightly fewer Warblers and Thrushes than in recent days. The 1st of May was a cool breezy affair, with other commitments resulting in just 20% island coverage but 4 hours were spent at the nets in the evening. The Glossy Ibis was still present while 30 Barnacle Geese flew north and 2 female Sparrowhawks included a smart adult caught and ringed. There were still plenty of common passerines about, with a Pied Flycatcher, 4 Tree Pipits and 19 Chiffchaffs the most noteworthy. There was a bit more to report from a scorcher of a day on the 2nd when 40% coverage and another 4 hours ringing time was finished off in fine style when a Spotted Sandpiper-moulting into summer-plumage was found at the pier late evening. With half an hour of daylight left, there was a mad scramble as the sun set over the island but all managed good views of thi,s the second North Ronaldsay record (the first was in September 2008). Other highlights from the day included a Wryneck showing well to guests at dinner-time outside the Obs lounge, the Hawfinch still at Holland and 3 Garganeys (pair at Westness, and single drake at Hooking). A Grasshopper Warbler, 5 Bramblings and a Siskin were also at Holland and at least 17 Mealy Redpolls (possibly as many as 30) were present. 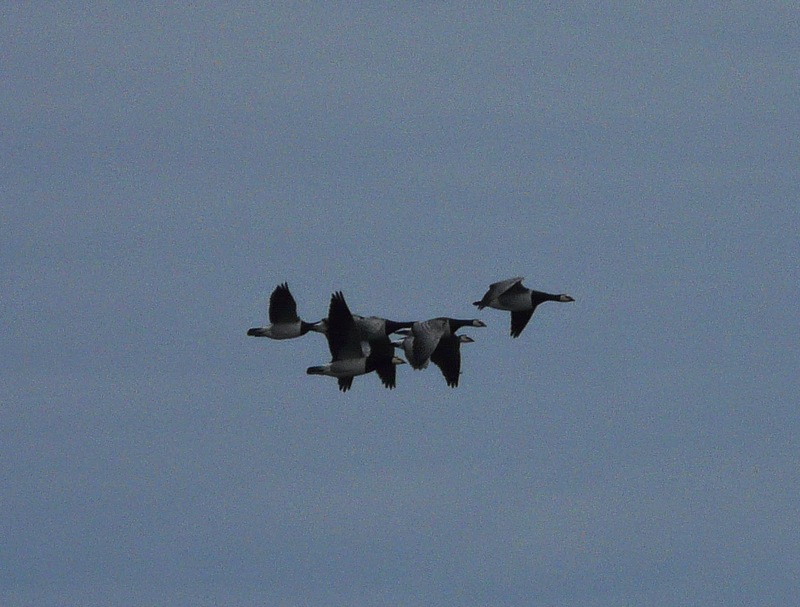 Another 7 Barnacle Geese flew north and 6 Carrion and 8 Hooded Crows were also on the move. 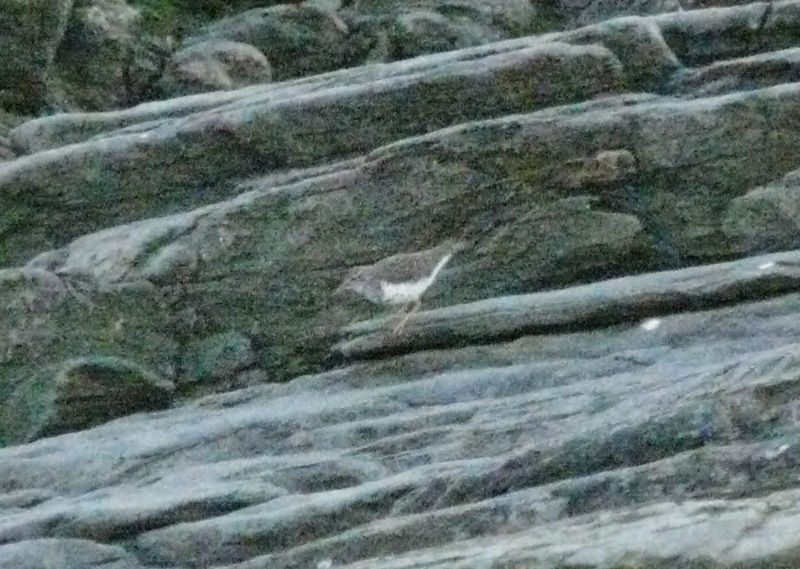 A record shot of this evening's Spotted Sandpiper-we'll be back first thing tomorrow!